In a musty, dusty corner of my brain, there resides a card catalog full of bold names and deeds. Those names and deeds are cross-reference with my own subjectivity and experiences. When I need to, I do a mental flip through until I get what I’m looking for. When I hear a word like activist, my brain hums along. A loose definition forms, gossamer and ghostly, until it eventually takes shape and I am left with something concrete. A name, an example. Activist: Rosa Parks. Dolores Huerta, Ida Wells, Cecile Richards, Audre Lorde, Tarana Burke. Flip, flip, flip. More names. Nowhere in that catalog, not even at the very back, not even in the margins, does my own name appear. So what makes an activist? Is there a set of criteria which must be met, a level of activist activity, akin to one of those strongman hammer do-dads at the town carnival, which must be reached before one can wear the label? I’m sure I’m not alone in envisioning activism with a capital “A” and an exclamation point. An all-encompassing noun involving sweeping gestures and noble sacrifice. The word conjures ideas of single-minded crusades, 100% dedication, and bold acts. How many times can you screw in a lightbulb emblazoned with the word ACTIVISM before you think of yourself as an activist? The day after the US 2016 election I set up an ongoing monthly donation to Planned Parenthood, an organization of great importance to me. If anyone asked me what I wanted for Christmas I pointed them to the Center for Reproductive Rights. I ramped up my funding for political candidates whose ideas and ideals I could get behind. Still, I didn’t consider myself an activist. I marched in 2017 during the Women’s March, but also in 1992 in Washington, DC for reproductive rights. In the late 1980s I marched along the streets of NYC in black, high-top Adidas during Take Back the Night. I marched against the Gulf War, with young men I knew, men just tripping into adulthood, whose eyes reflected their fear that a war none of us wanted would reach out its greedy fingers and mark them irrevocably. Still, I didn’t call myself an activist. I write and publish essays about feminism. I regularly bore the pants off many men…and women… highlighting gender bias. I endure countless eye rolls as I patiently work my way through the nuances of the wage gap. I introduce new-fangled terms like the Motherhood Penalty. I use my social media platforms to speak out against harmful policies. And I have raged, oh, how I’ve raged, both privately and publicly, each time we take two steps back in this tango of equality. Yet still, I don’t use the word activist to describe myself. Perhaps, however, my definition is too narrow. Perhaps…just perhaps…I should be embracing my personal acts of activism. 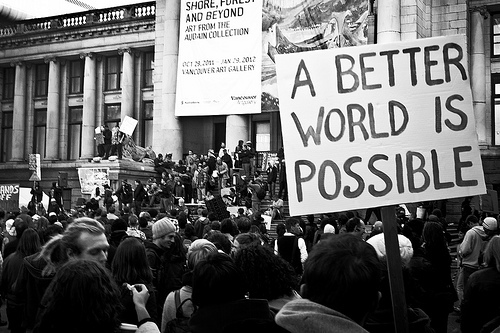 Activism with a lower-case “a” rather than a capital. With a quiet sentence ender rather than an exclamation point. And perhaps…just perhaps…if we all did that, instead of assuming that what we do is too little, too late, or too insignificant, there would be enough excitement to warrant that exclamation point after all. There are times when you face the mountain and the mountain seems un-scaleable. What is one person, one act, one small thing going to do? When one lone person takes their canvas tote to the supermarket, is it really going to help the Earth? Is it going to make a difference to climate change? It’s difficult to fit you and your small, canvas tote into the bigger picture. Is my ten dollars a month going to make a difference to Planned Parenthood? My fifty dollars a year is, after all, merely a drip in the coffers of the ACLU. My body, one of thousands, will not be missed if I don’t march. My voice, one among thousands, will not subtract from the din. But if we’re all kicking the can down the road to others because we think we can’t make a difference, if we’re putting out a small spark because we’re not comfortable carrying a torch, does that torch, regardless of who is carrying it, ever stand a chance at staying lit? Imagine if a young Ruby Bridges, walking to school under the protection of federal marshals to desegregate a Louisiana classroom felt one lone girl wasn’t enough. Imagine if Shannon Watts thought one mother crusading to change the way we look at gun laws thought one mother wasn’t enough. Imagine if Dolores Huerta had assumed that one woman alone could not make a dent in the fight for farm workers. What would we be left with? There are hundreds of ways to help force change in the places we believe need change. We can donate money or fundraise to help others do so. We can give our time, our talents. We can add our bodies. We can show up. We can call out. At the end of the day, I am but one voice, a whisper in a sea of noise. But if I add my voice, my whisper to the lone whispers of others, if we all do that, it becomes a scream too loud to ignore. And so I continue. Not because I expect to change the world all by myself, but because if there are a hundred other “me”s out there, a thousand, half a million, think of the possibilities. We are all activists, intentional or not, when we stand up for change we believe in. When you carry the tote bag, when you call out sexism, when you join a march, when you donate to a cause. They are acts of everyday activism. The exclamation point doesn’t need to be there. The capital “A” doesn’t need to be there. A thousand small, everyday acts become bold when they are taken together. Find the cause or causes you are passionate about, find the things you want to change. And fight for them. Fight for them a little, fight for them a lot. Fight for them in ways large and small, but don’t ever think those acts, however everyday they seem, aren’t making a difference. You have a voice. And if you use your voice for change? Well then my friend, you are an activist. And don’t let anyone, least of all yourself, tell you differently. Thanks, Beth. I fall into my own trap plenty…does any of this really make a difference? What can I do? Is there anyone OUT THERE LISTENING?? The danger is if everyone thinks that way, nothing ever changes. You’re right, our small everyday acts do make a difference. I don’t go on marches now but have become an e-activist. I have to believe so. And I do. Thank you for these thoughts. My mind has wandered along the same lines in the last year, as I’ve struggled with everything that’s happened (when will we come up with an adequate word that describes the ugly, devastating evil we’re dealing with world-wide?!). I,, too have marched and donated and written…and often despair over making no difference. I try to remember the “sphere of influence” concept – that we do have the responsibility and power to make a difference to the people and needs that we come into contact with, and I try to believe that’s enough. Hearing something similar from someone I respect makes it easier to believe. I’m definitely hanging onto your coined word, “micro-progressions.” Brilliant! Wow. I too hesitate to think of myself as an activist when I write to Congress or take the time to educate myself and others about things for which I am passionate. This was a great encouragement and affirmation to me today. Thank you so much for sharing this. I feel the same way all the time. What am I doing? Or, “it hardly matters in the big scheme of life”. But I always come back to the idea of the butterfly effect. You never know when there will be enough of those small movements to cause a tidal wave. And I’m incredibly flattered. I’m not sure I’ve ever inspired a poem before :-). At least not an original one. Thank you for sharing it with me and here. Would you mind if I shared it on the blog’s Facebook page? Yes!! If only we all understood this! Raising your children to be feminists is activism. Being intentionally kind to people you disagree with is activism. Loving in a hateful world is activism. 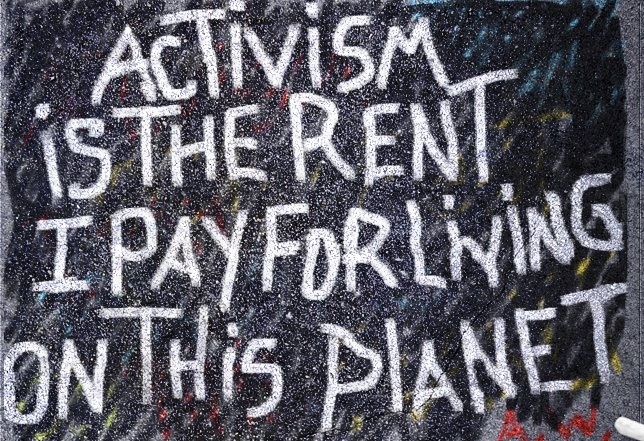 There are so many wonderful ways to be activists. And we should celebrate them all. We all work with what we have, and we should be proud of that. Well said, Shana. Raising feminist boys is probably one of the most radical acts of my life. And one I think I was put on this Earth to do. Also, great point about being intentionally kind to people you disagree with. That’s tough–but important. And it is absolutely a form of activism–because it helps t bridge those gaps that are stopping true change. Perfectly to the point, as usual! There are times when I have that feeling in animal rescue. You volunteer, you donate, you try to educate people, but it just never stops. Abused horses, neglected dogs, discarded cats. For every one you manage to help, ten more wait in the wings. It makes you wonder if you make any difference at all. But then you remember – I made a difference for that dog. That horse. That cat. For the dog, it’s everything. Those last few lines were perfection. For that one person (or animal, etc.) who is affected, it’s everything.